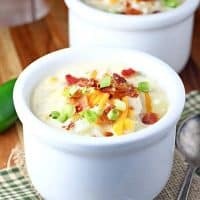 JALAPENO POPPER CHICKEN CHOWDER — This creamy, hearty soup features fresh jalapenos, chicken, corn, potatoes, bacon and cheese. If you’re a fan of jalapeno poppers, then you are going to love this hearty Jalapeno Popper Chicken Chowder. 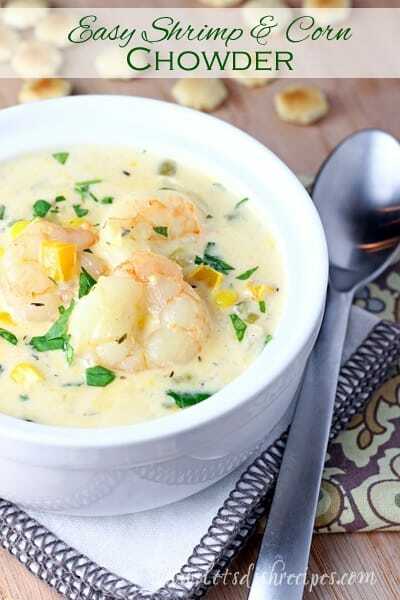 It has all the flavors of the classic appetizer in warm, comforting soup form. Chicken, bacon, potatoes, corn, two kinds of cheese and fresh jalapenos…..you might ask yourself what doesn’t this soup have? It’s loaded with so many great flavors, it’s sure to be a hit with everyone. Even people who don’t like spicy food love this soup. It’s really not too spicy. Especially if you remove all the seeds and ribs from your jalapeno peppers. If you like things spicier, then go ahead and leave some of those seeds. Otherwise, the jalapeno flavor is pretty mild. And the creamy soup base really offsets any heat from the peppers, making this a soup enjoyed by even picky eaters. Trust me, I have a few at my house. To say my family loved this soup is a huge understatement. In fact, I’d go so far as to say this is their favorite soup. Luckily, it makes a huge pot, so we can enjoy it for two days and I only have to cook once. If you don’t want to have soup for days, you may want to half the recipe. 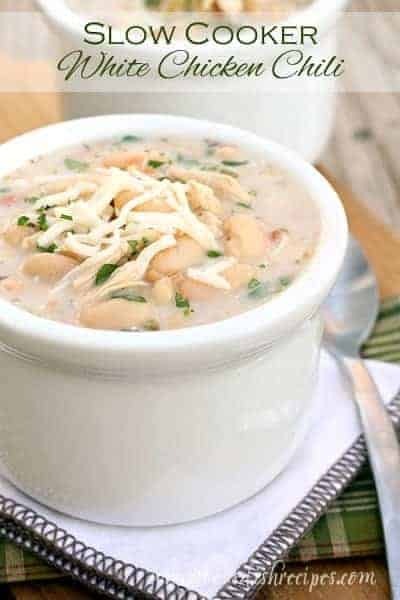 If you’re feeding a crowd or having friends over to watch the game, then this soup is the perfect way to feed everyone. 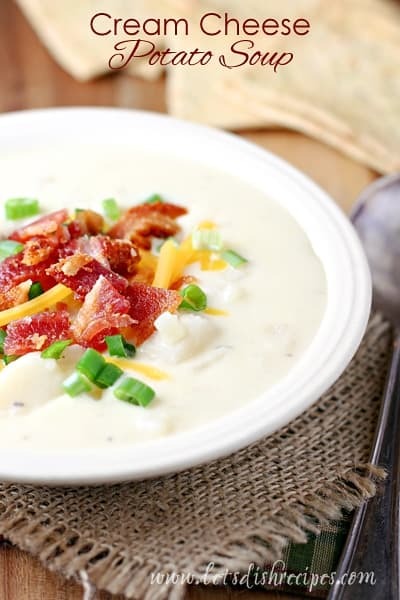 We like to top our soup off with some extra green onions, bacon and cheese. Okay, I admit. I like to add a lot of green onions, bacon and cheese. If you’re looking for something truly comforting and delicious to serve your family on a chilly day, then you’ve got to try this Jalapeno Popper Chicken Chowder. I hope you love it as much as we do! 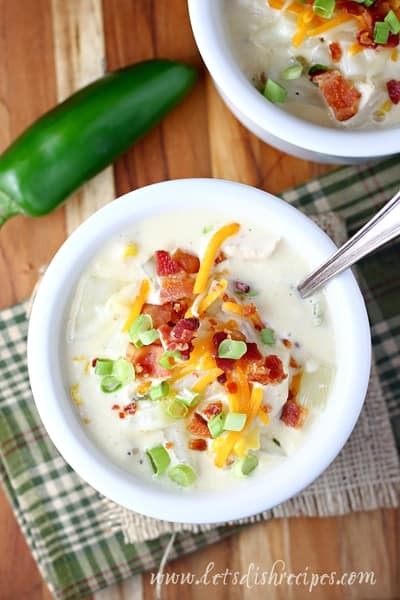 Be sure to save this Jalapeno Popper Chicken Chowder recipe to your favorite Pinterest board for later. 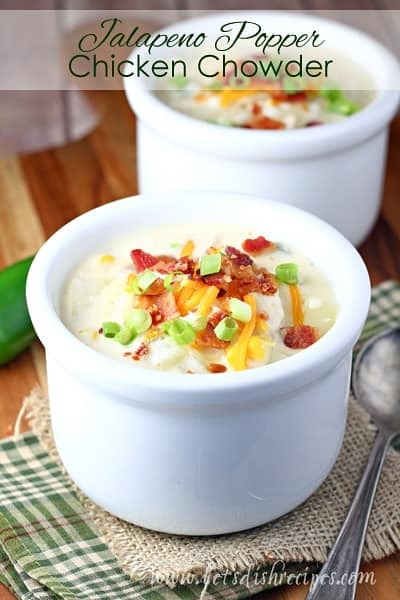 This creamy, hearty soup features fresh jalapenos, chicken, corn, potatoes, bacon and cheese. The perfect meal for a chilly day! Bring a large pot of water to a boil over high heat. Add diced potatoes and cook until just tender, 8-10 minutes. Set aside. In another large pot, melt butter over medium heat. Add diced jalapenos and garlic and cook until tender, 3-5 minutes. Stir in flour. Whisk in chicken broth until smooth, followed by half and half. Bring to a simmer and cook until thickened, about 5 minutes. Whisk in cream cheese and cheddar cheese. Cook, stirring often, until smooth. Stir in creamed corn, chicken and cooked potatoes. Add a pinch of cayenne, if desired. Simmer for an additional 10-15 minutes, stirring often. Season with salt and pepper, to taste. Just before serving, stir in bacon and green onions. Top with additional shredded cheese, bacon and green onions for garnish, if desired.